It’s that special time of the year again – it is wedding season in Westeros! In King’s Landing, Tommen and Margaery tie the knot and Margaery wastes absolutely no time sinking her teeth into her husband and king, much to Queen Mother Cersei’s dismay. Meanwhile, in the North, Sansa Stark gets to try her hand at marriage a second time after a frankly disastrous first shot with Tyrion two seasons ago. She is to marry Ramsay Bolton, a match that might quite literally have been made in hell. For his part, Ramsay is happy enough but Littlefinger is playing a deeper game here, to no one’s surprise. In Braavos, Arya is not having the easiest time of her Faceless Man training and has to adjust to a new, different way of life. Finally, in the North, Jon realizes that not everyone is happy with him in power and decides that he needs to lay down the law at the Wall. There will be repercussions for his actions, surely enough, whether he likes it or not, but for now, the potential mutiny has been quelled and life at the Wall carries on. Watching Margaery begin the slow process of turning Tommen against his mother is exactly like watching a worm eat an apple out from the inside. In previous seasons, there some, minimal level of reasonable doubt with regards to Margaery – that perhaps all this scheming and plotting was her grandmother’s doing and that Margaery herself was really as innocent and sweet as she liked to portray herself. That notion was quickly dispelled in her second or third appearance but even considering that, her efforts on Tommen are a masterclass in manipulation. Tommen is so tightly wrapped around her little finger, no one would be surprised if he was her wedding ring. Of course, Cersei is distinctly unhappy about this arrangement and not just because she intensely dislikes Margaery. Her influence and power come from her position was the queen hen but ultimately, Tommen is the King and the minute he begins to favour Margaery over her, Cersei is in trouble and she knows it. The odd thing is that it’s hard not to feel a little bad for Cersei as Margaery begins turning Tommen against her; say what you will about her, she has always loved her children and even she deserves better than for one of them to turn against her. On the other hand, Margaery is clearly loving every moment of her queenship – and more than being queen, she seems to enjoy rubbing her status in Cersei’s face. Of course, Cersei is not the kind of character to take such affronts lying down. She knows her power and influence is waning and her Small Council is hilariously impotent. The heavens send her gift in the form of the High Sparrow, a kindly religious fanatic. The High Sparrow himself seems like a kind and gentle figure, caring for the poor and generally being what you would want your Pope-figure to be but his followers are a different story entirely. They are fanatics, pure and simple and while the High Septon is an unsympathetic victim, we need look only at history in our own world to see how quickly such religious movements can spiral devastatingly out of control. Cersei is playing with fire but trying to court this High Sparrow, but of course, being Cersei, she doesn’t realize it just yet. Sansa, on the other hand, is painfully aware of just how precarious her situation is. Ramsay Bolton has never been the most mentally stable of men and the potential for their marriage to turn into domestic abuse nightmare is depressingly high, not that Sansa needs any reminders – she hasn’t forgotten Joffrey. However, it doesn’t seem like Sansa realizes this about Ramsay just yet; her reluctance is for other, equally valid reasons. The Boltons murdered her family and gaining control of her own home through them just leave a taste more bitter than a rotten lemon cake in her mouth. Littlefinger’s motives for this match are still uncertain – perhaps he wants something from Roose Bolton, who will undoubtedly be glad to have some legitimacy to back his new position as Warden of the North, or perhaps Littlefinger thinks he can control the North through Sansa. Either way, it’s pretty obvious that things are not going to go according to plan – this has disaster written all over. Apart from that however, Sansa’s return to Winterfell is a tender moment. She left her home a young girl and in the years in between witnessed and experience more than her fair share of horror. Coming back to it in her circumstances must certainly be painful and even more so knowing that the strangers inhabiting your home were responsible for your family’s death. Theon was careful to avoid Sansa, no doubt because he is ashamed of his role in the Starks’ defeat but perhaps also because he is ashamed of what he is now. It would come as no surprise to anyone if Ramsay were to present a thoroughly chastised and humiliated Theon to Sansa as a wedding gift and given her current state of mind, it’s uncertain exactly what Sansa would think of that. 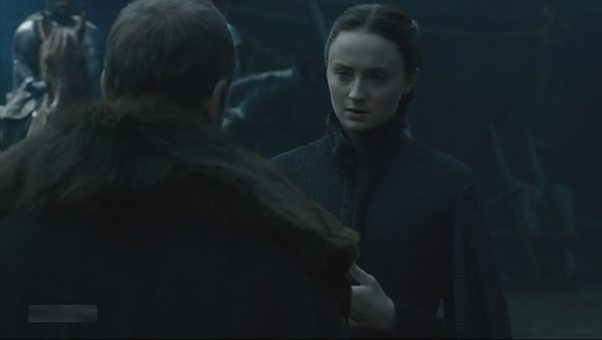 On a final note, there are the smallest of hint that the Bolton’s hold on the North is not quite as firm as they would like to believe – the elderly woman leading Sansa to her chambers tells her quite ominously that the North remembers while even now, Ramsay has to deal with defiance from minor lords in the North. Ramsay isn’t afraid, of course; as long as there people maim and mutilate, it’s all the same to him but Roose is certainly anxious even if he isn’t showing it. Littlefinger would do well not to push him too far – he is firmly in Roose’s hands and Roose hasn’t been known to treat his allies too well. Arya’s training isn’t exactly the most fascinating part of the series. The scenes are slow and rely more on the novelty of the setting and the mystique surrounding the cult of assassins instead of actual plot developments and dialogue. The episode drives home the message that Arya needs to make some big sacrifices if she is to really fit in at her new home. Arya slowly losing her identity will be the central theme of her story for the season, it would seem, though of course, she will never be able to completely forget all that she has seen and endured. Her decision to keep Needle was very well done, and really conveyed the weight of her decision though you have to wonder if anyone still remembers that Jon Snow gave her that blade all the way back in the first season. At the series’ current pace, we can expect Arya to make her first kill in a couple of episodes’ time. Meanwhile, Jon has wasted absolutely no time in making his first kill. Janos Slynt’s execution is by far one of my favourite moments from the books, the definitive moment in which we learn that Jon Snow is not someone you can take lightly. Jon takes no pleasure from Slynt’s death in the novels, but there is a certain satisfaction on Kit Harrington’s face when he takes the coward’s life. That in and of itself is a trifling matter but the scene’s pace was a little too rushed – one moment Janos is being his usual self and the next he is begging for his life, ready to wet himself. It’s not how I would have done it, but it’s not bad either. Stannis’ tiny, almost imperceptible nod, seals the deal.